Yahya Staquf, a diminutive, soft-spoken leader of Nahdlatul Ulama, the world’s largest Muslim movement, and Indonesian president Joko Widodo’s advisor on religious affairs, has held a series of meetings in recent weeks that reflect the Muslim world’s shifting attitudes towards Israel and the Palestinians and a re-alignment of socially conservative Muslim and Christian interests. Just this month, Mr. Staquf, a staunch advocate of inter-faith dialogue and religious tolerance, met in Washington with Vice President Mike Pence, a devout evangelist Catholic who has described himself as "a Christian, a conservative, and a Republican, in that order," and in Jerusalem with Israeli Prime Minister Benyamin Netanyahu. Messrs. Pence and Staquf were joined by Reverend Johnnie Moore, an evangelist who in May was appointed by US President Donald J. Trump as a member of the board of the US Commission on International Religious Freedom. Mr. Staquf’s discussions would likely raise eyebrows at any given moment. But they take on added significance because they came in the wake of Mr. Trump’s controversial recognition of Jerusalem as Israel’s capital, stepped up US support for Israel in United Nations bodies, and in advance of a whirlwind visit to the Middle East by US peace negotiators Jared Kushner and Jason Greenblatt. Palestinian President Mahmoud Abbas’ Palestine Authority has refused to engage with the Trump administration since the US recognition of Jerusalem and Palestinian officials were unlikely to meet with Messrs. Kushner and Greenblatt during their Middle East tour that focused on a draft US plan to resolve the Israeli-Palestinian conflict. Details of the plan, described by Mr. Trump as the ‘deal of the century,’ remain under wrap, but Palestinians fear that it will be heavily geared towards supporting Israeli negotiating positions. That fear has been reinforced by the Trump administration’s fiery support of Israel in the UN. The United States this month withdrew from the United Nations Human Rights Council, citing, among other reasons, the council’s repeated criticism of Israel. Whether by design or default, Mr. Staquf’s meetings appeared to reinforce efforts by close US allies like Saudi Arabia, the United Arab Emirates and Egypt to stifle opposition to Mr. Trump’s approach to Israeli-Palestinian peace. Turkey has been in the forefront of condemnation of US policy that resonates in Muslim public opinion, particularly in Asia. Frustration with US and Israeli policies has undermined popular Palestinian support for a two-state solution that envisions the creation of an independent Palestinian state alongside Israel. Hamas, the Islamist group that controls the Gaza Strip, has facilitated weeks of protests along the border between Gaza and Israel in support of the Palestinian right to return to lands within Israel’s boundaries prior to the 1967 Middle East war during which Israel captured East Jerusalem, the West Bank, Gaza and the Golan Heights. Israel has since annexed East Jerusalem and withdrawn from Gaza, which it blockades together with Egypt in a bid to undermine Hamas’s rule. At least 142 Palestinians have been killed by Israeli forces since the protests erupted in late March and some 13,000 wounded. Mr. Netanyahu trumpeted the political significance of his meeting with Mr. Staquf in a statement following their encounter. “Muslim states are becoming closer to Israel because of the common struggle against the Iranian regime and because of Israeli technology. … The prime minister hopes that there will be progress in our relationship with Indonesia, too,” Mr. Netanyahu’s office said. 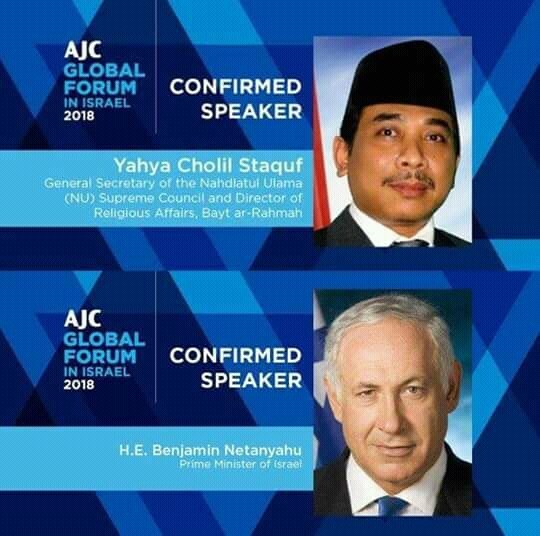 Indonesia and Israel do not maintain diplomatic relations but do not stop their nationals and officials from travelling between the two countries. Mr. Staquf has insisted that he was visiting Israel in his private capacity rather than as an advisor to the Indonesian president. Indonesia recently revoked Israeli tourist visas in protest against Israel’s hard-handed tactics in Gaza. In response, Israel has threatened to ban tourist visas for Indonesians. Some 30,000 Indonesians, mostly Christian pilgrims, obtain visas to visit Israel each year. Indonesia in May exempted Palestinian imports from custom duties in a bid to support the Palestinian economy. Mr. Staquf insisted that his visit to Israel at the invitation of the American Jewish Congress was intended to promote Palestinian independence. “I stand here for Palestine. I stand here on the basis that we all have to honour Palestine’s sovereignty as a free country,” he said in a statement posted on his organization’s website. Mr. Staquf was the second NU leader to visit Israel in the past two decades. Abdurrahman "Gus Dur" Wahid travelled several times to Israel before and after his presidency but not while he was Indonesia’s head of state. Muslim leaders, many of which have long reconciled themselves to recognition of the State of Israel’s existence, have largely been reluctant to publicly engage with Israeli officials as opposed to non-Israeli Jews as long as Israel and Palestine have not made substantial progress towards peace. Mr. Staquf like Mr. Wahid before him broke ranks by travelling to Israel, a move that sparked criticism and condemnation on Indonesian social media and from some members of parliament. While the criticism has focussed on Mr. Staquf’s visit to Israel rather than his meeting with Messrs. Pence and Moore, it is also rooted in widespread perceptions of evangelists as purveyors of rising Islamophobia and anti-immigrant sentiment. Lost in that criticism is the fact that Saudi Crown Prince Mohammed bin Salman is being hailed by some evangelists as heralding a new era with his projection of greater religious openness in the kingdom and his unprecedented statement that both Palestinians and Israelis “have the right” to have their own land. "You know I couldn't believe my ears actually when I was watching the news report where the crown prince of Saudi Arabia said directly, verbatim, He said this kingdom will become a kingdom for all religions. I had to watch it again and he was crystal, crystal clear. You know as evangelicals this is a new day for us in the Middle East. Evangelicals are the baby Christians in the region… What we're seeing is a new openness to what evangelicalism is, which I think is a move of the Holy Spirit." Mr Moore said. Mr. Staquf projected his visit to Israel as promoting the concept of rahma or compassion and mercy as the basis for a solution to the Israeli-Palestinian conflict and the forging of relations between Israel and the Muslim world. In practice, by design or by default, it supports US and Saudi efforts to impose their will on the Palestinians and the larger Middle East that potentially could produce as many problems as they offer solutions. In doing so, it pays tribute to Prince Mohammed’s ability to project himself as an agent of change in Saudi Arabia even if the precise contours of his vision have yet to emerge. In a twist of irony, it is a tribute by the leader of a movement that was founded almost a century ago in opposition to Wahhabism, the ultra-conservative Sunni Muslim worldview that long shaped Saudi Arabia and that Prince Mohammed is seen as disavowing.